It is truly amazing, how each nation, throughout history, has also been influenced by other nationalities. While this foreign influence has added to distinct cultural differences from nation to nation, region to region, similarities still abound. If you don’t know how to say some words in other language, art is something that can unite all of us. You can imagine, what exactly the artist wants to explain, how he or she is really thinking, while working on paintings or making sculptures. Artists are the connectors; they show us our emotions and feelings and make us much better that way. We can see the beauty of this world through their eyes – especially when we can’t see it for ourselves. Artists are the best historians – when you want to know how early people lived, you look at their cavern’s pictures. You can imagine how people were thinking during medieval times or in Renaissance just looking at paintings or sculptures. Art can talk for itself. And artists inspire us to move forward and live a joyful life. It’s more important, when we’re talking about female artists. Women are more emotional and sensitive. Everything we feel we can express in words, in pictures, in sculptures, in jewelry – even in a salad, finally. I was born in Moscow, Russia. It’s not difficult to express myself in English though Russian is my native language. I have a lot of Americans friends, but sometimes we hardly understand each other, because we have different background. Sometimes it’s even easy to play “Picture it!” drawing game than to explain, what exactly you want to say. I always asked myself how you have to feel to be a Russian-speaking artist, living in America. How easy it is to express your feelings to other people, if you’re talking in different languages. How to explain the main idea of your art, what exactly you wanted to say when you draw it – that was my question. I wanted to write this book to show that we all are the same. Flower is a flower, doesn’t matter how to call it in Russian, or English, or Spanish or in any other language. All of artists I’m writing about moved to America from former Soviet Union – the unique country with a different ideology and complex history. Americans are more familiar with the famous Russian-speaking artists who lived in the 19-20 centuries (like Kandinsky, for example) and Soviet-time immigrants like Ernst Neizvestny. Since their talents are unquestionable, there are plenty of contemporary artists with Russian background I want to talk about. For the most part modern immigrants have succeeded in assimilating into mainstream American life and it’s hard to separate their Russian background from their American life now. But as I said above, it is still hardly noticeable difference in their art – and that is what turns their paintings, sculptures, jewelry, and books into real gems! I chose artists, working in different genres to show that art is perfect in all its manifestations. My goal is to promote the imaginative, artistic talents of women from various ex-Soviet Union republics. Representing a diverse array of mediums, all of them are professionals who have dedicated their lives to perfecting their art. I wish American public appreciate these incredible, unusual, and interesting artists. You can buy the book from Amazon.com in paperback or kindle format here or from Barnes and Noble website here. The New York Public Library will present “Art Without Borders: Seven Inspiring Art Stories” at the Riverdale Library branch on Thurs., Apr. 30th with Russian-born journalist and writer Victoria Averbukh as host. 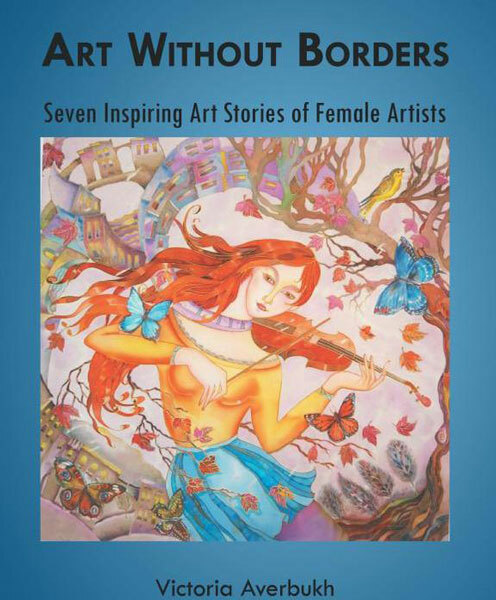 The presentation will focus on the stories of seven Eastern European female artists who share their immigration experience and ways in which they have acclimated into American culture. While all seven artists work in different mediums, their shared experiences create a common thread, weaving their Eastern European Roots into their American lifestyles.